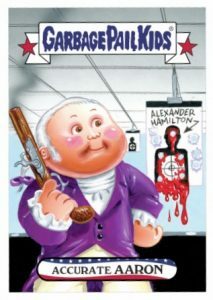 Adding more variety to the 2016 Topps Garbage Pail Kids lineup of online exclusives, not even the founding fathers are safe from 2016 Topps Garbage Pail Kids 4th of July. The limited set is only sold though the Topps online store for one week before being removed from production. 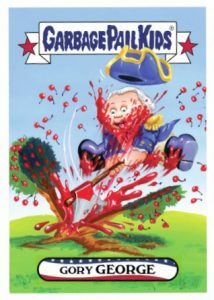 Centering on both former presidents and key figures from U.S. history, 2016 Topps Garbage Pail Kids 4th of July includes a total of eight cards with four new GPK images. Among these are playful takes on George Washington and Thomas Jefferson. 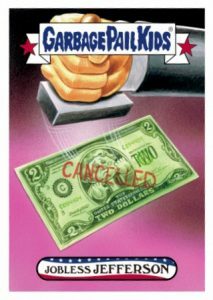 The 2016 Topps Garbage Pail Kids 4th of July release is sold by the subject or set with two-card issues going for $9.99 and the full eight-card set selling for $24.99. The cards will be available until 12 PM EST on 7/5/2016. 8 cards. Announced print runs will be added when available. 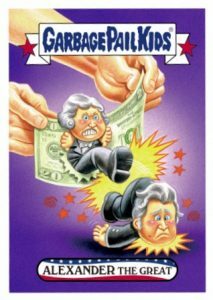 Shop for GPK 4th of July cards on Topps.